Remember when you were a kid and it snowed? We couldn't wait to get all bundled up and go sledding. Every kid in town would gather at Meyer's hill and sled all day. Mr. Meyer would build a huge bonfire so we could get warm. We didn't have a care in the world, other than trying to get back up the hill as fast as possible. 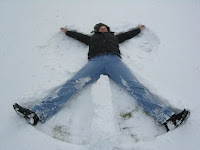 One of the best things to do was find a nice, flat, untouched spot of snow and make a snow angel. The key was to fall back flat on the snow, wave your arms and legs and get back up while not disturbing the snow around the angel. I have to say, it is not as easy as it sounds. Every once in a while, you would make the perfect angel. It was a thing of beauty. Now this was before the time of camera phones or digital cameras, but the pictures in my mind are just as vivid. It is a wonderful memory. Do yourself a favor, don't forget to be a kid. Be silly, have fun, laugh, have a snowball fight, go sledding and for God's sake, make a snow angel. Life was meant to be fun...don't forget to have fun. You won't regret it. I'll make snow angels with you this winter if we get any snow. I can't promise that a few snowballs will not be tossed in your direction.